Two Bears Farm and the Three Cubs: Log Home House Tour! Come on in! Log Home House Tour! Come on in! Normally our house is so overtaken by toys that I don't like people to just stop by. However, this past weekend I hosted a brunch for new moms to twins, and after a solid twelve hours of cleaning (you know, the type of cleaning where you scrub floors by hand and clean light switches and window panes) I decided to take a few pictures. I was positively giddy to have such a clean house, just for a day. I even hid a good number of toys in closets (and outside! ), and I felt like I had a grown up house for a short time. I love our house. Paul and I designed the floor plan ourselves. We also did some of the work ourselves - Paul built the countertops and we did all the painting and staining. 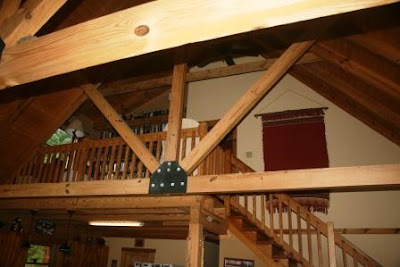 A view inside the loft. We also have a guest room but I didn't think to take a picture of it. Someone brought me this calla lily to the brunch. If I plant this outside is it one of those things that will come back next year? Anyone know? Well, by the time this post publishes, there will be piles of dog fur on the carpet and raisins smushed into the hardwoods again. But it was so nice, just for a day, to feel a sparkling house. Hi Lisa, Your log home is so welcoming. 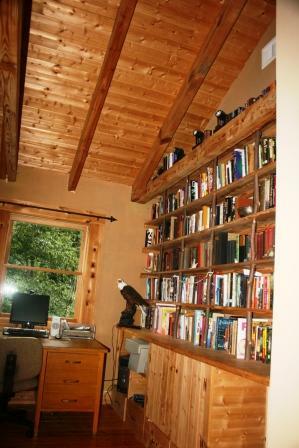 I love the loft with the bookshelves, especially. It's gorgeous! I love your home! You have a lovely home Lisa. How wonderful to live in a timber house. Just looks so warm. Gorgeous absolutely GORGEOUS! I love the details. I especially love the beams that come together and look like a half circle... does that make sense? My house only lasts for a few minutes too, oh how to bask in the awesomeness of it though! That calla is beautiful, I've never seem one so vivid. As far as I know (which doesn't account for much in the plant world) callas fo come back ever year & the multiply too I think. Lisa, your home is absolutely beautiful! I love everything about it. You and your husband did a great job. Thank you for sharing a another piece of your life with us. Yes, the cally lily will grow if planted outside. i've always loved the log house look and yours is incredible!! the wood is beautiful. i've hidden toys too : ) ha -- isn't it amazing that a totally clean house lasts such a short while with kids around? I love your home! The color of the wood is beautiful. Your home is so pretty! I love log cabins! It certainly doesn't seem small to me! I love small homes and if we ever build again, we are so going WAY smaller! Yours looks super you guys did a great job! What a gorgeous house! Love log homes and your floorplan is excellent. I'd love to fall asleep under those beams every night. I do my once-per-year cleaning around July 4th. I should have taken photos. wow, lisa, it's beautiful!!! GORGEOUS woods! and i love all the windows and open-ness. ohhh can i come live with you!!??? I love log homes!!! WOW Lisa. Lets house swap for just a week. ;) Your house is gorgeous...absolutely gorgeous!! I bet you could rent it out for a week for a nice chunk of change! Thanks for sharing a little piece of your life! Oh my goodness Lisa - your 'grown up' home is gorgeous! I love the open look so much. Beautiful. LOVELY home..I'm crazy about it! We are in the floor plan design stage of building a cabin of some sort on our land. Gosh it's a wild ride. Your place looks wonderful! I hope we can be so lucky! I love seeing other cabin owners homes. Thank you for sharing. Don't feel bad about the toys. I don't have any children at home anymore but I've managed to replace toy clutter with craft clutter!! I love your floor plan and all the custom touches you've added to your home. It's obvious it was built with a lot of thought and love. Your home is lovely, Lisa, inside and how the outside comes in! Beautiful home...love all the books! i LOVE it! it's exceptional! hooray for a clean house if only for a moment! funny how it feels so much easier to breathe :) love the log cabin. our house is a cottagey wanna be version of one. ha! thanks for allowing us to see your beautiful house. You have such a warm and inviting home! So charming! I'm not a fan of wood, but you make it look great! What a beautiful home! I love your reading/desk area! Oh, I was just so excited to get this tour of your home, it is GREAT!!! there are so many log cabins around here, both real ones and the modern ones, too. I have a whole post to do on them. Your house is spacious, bigger than ours. And I love that big deck!!! And the huge tall ceilings!! How do you come to know so many other moms with twins? Do you have some kind of support group or something? I love your house, it's awesome! Can I move in? 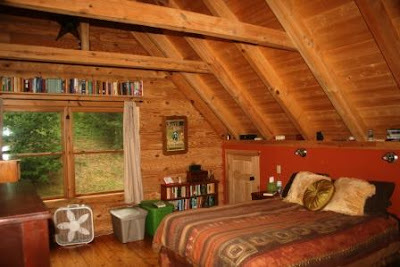 I want to live in the loft. Oh my gosh, your bookshelf! I love it!!! That is one gorgeous home! Thank you for inviting us in! I love wood but the husband isn't crazy about it. Calla lilies are a perennial plant, they do come back every year & even multiply, but you have to be in a warmer zone. I just found this info http://www.callalilyshop.pacificcallas.com/planting.htm. Love your home! I wish I had an area like your loft where I could store all my books. What a beautiful home! I love it. Your home is just awesome! I really like your master bedroom and how impressive that you all designed it and did so much of the work. What a labor of love. It turned out so beautifully! Oh my goodness! I love your home too! It's beautiful and so homey. I have always loved that log cabin feel and I'm much happier when my home is clean too...I'm looking at my living room now...hmph. You did a great job designing it and with all that hard work on painting and staining. Beautiful! WOW!! what a beautiful home!! Love it! 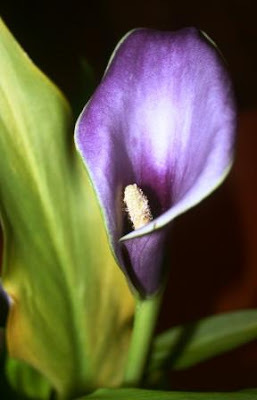 I've never seen a purple Calla lily before! All I know is that they are very hardy. I had one die all the way back because I didn't take it inside during the winter (I live in South GA where it does not snow) and it came back, bigger and greener than ever...Mine's full of blooms right now - it loves it in the pot on the front porch in partial shade. I don't have enough room inside the house, or else it could live in here! Mine is white! I enjoyed the tour of your lovely home :-) Thank you! 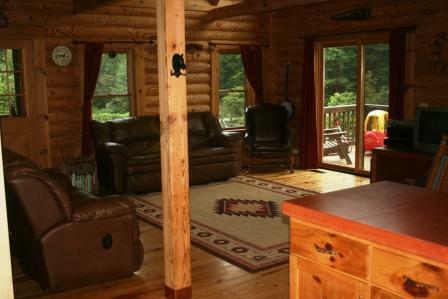 I have always adored log homes, and yours is beautiful. I've given up on having that pristine home until after the kids leave. Even as teens we get all sorts of stuff squished into the floors. Enjoy every second of living there! Wow! Your home is gorgeous!! I love it!! I wish my house could stay clean for longer than an hour. I love your house! All those books are the best!!! You have a beautiful log home which you can be proud of. It looks cozy and inviting. If you have roots, yes, you can plant it. They like shade and part shade (at least here in hot So. Cal. ), but some varieties are temperamental and don't have leaves/flowers every year. They'll go dormant and you'll think they are dead, but will come back the following year. They are extremely hardy. Mine take the 120 degree heat in the summer and below freezing nights in the winter. One of our friends in Nor. Cal. has white ones and they grow and grow and grow like weeds and flower each year. Wow, what a beautiful house you have! And it really looks very neat! I have only one daughter and my house is always covered with toys. I can only imagine how is like when you have 3 boys! Stopping by from Blog Frog( "Let's follow each other" discussion) and following you! 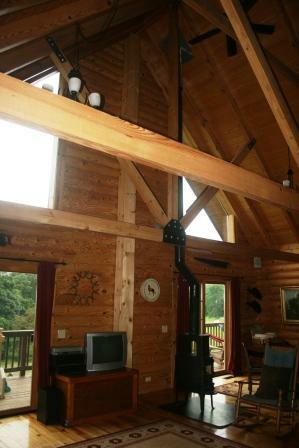 We too have a log home that we designed to fit our needs and worked on ourselves. It is a good feeling isn't it? I love your cabin! The colors and the floorplan are perfect. I appreciate the tour. Your blog is wonderful. Thanks for stopping by mine. Your log home is gorgeous! I love that wall of bookcases! 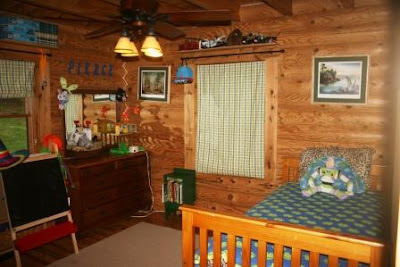 Your Jim Barna Log Home is what we would like all of our log homes to be, a place full of love and fun! I was delighted to talk with Paul this week regarding some questions he had, and I hope I was able to assist. 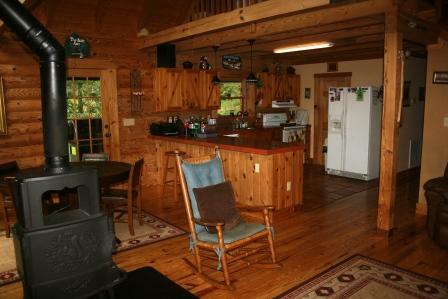 As the Virginia representative of Jim Barna Log & Timber Homes, I would be delighted to assist any of your "bloggers" with their own authentic, log home. They may contact me at mike@pineycreekfarm.com or by phone at 540-586-7272. Our website is www.pineycreekfarm.com. Love it! Thank you for telling me about the tour. 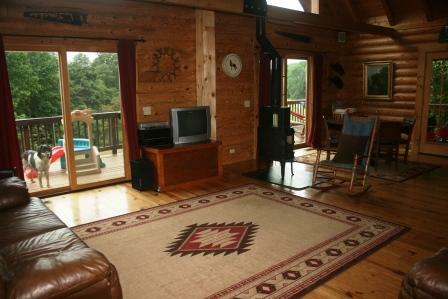 I have dreamed about living in a log cabin most of my life. You are blessed. Do we retire at the beach or in the mountains. Wouldn't it be nice to do both! 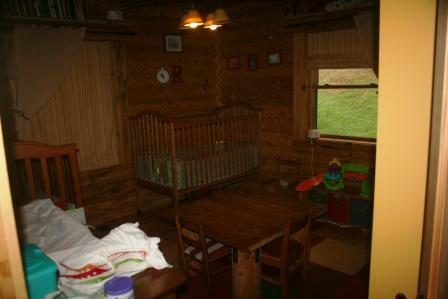 Do log homes get more dirty than normal ones? Or were you just being especially thorough?